Wind and weather for those living an active life. Wind observations and forecasts for windsurfers, kitesurfers, sailors, SUPers, surfers, fishermen, cyclists, hikers, golfers - you name it. Vic Wind 4.6 is Available! A new version of Vic Wind is available for download now. It includes a few bug fixes, and a new page which lists out live wind observations. Melbourne (Olympic Park) wind station has also been added to the Victoria page as well, which displays live wind speed and air temperature. Enjoy! Vic Wind 4.0 is coming! Please ensure you keep your Vic Wind app updated! We are always publishing new app updates which include enhancements and bug fixes. A new version of Vic Wind (3.08) will be available in the new few days for download here. There’s an issue viewing wind data history in Vic Wind after upgrading to iOS9. We’re currently working on a fix for this, so please stay tuned for another update shortly. Vic Wind 3.04 now available! We want some feedback! Please. 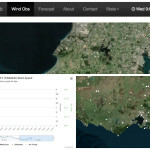 With the recent release of Vic Wind 3.0 for iPhone and iPad, we’re keen to know what you think. Feedback helps us turn Vic Wind into something bigger and better. Email us at info@vicwind.com.au Thanks to those who have already sent feedback in!